Simple Festive Holly 25mm Pin Badge. 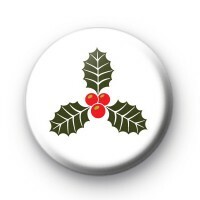 This white Christmas badge is off the classic winter holly, with the red berries and green spiky leaves. This is such a traditional thing to see around the holiday season and it looks fab on a Christmas Badge too. A super festive Xmas holly badge and we think our Christmas badges are perfect to hand out to at school during the Christmas period or use in Xmas party bags as fun favours & keepsakes. We have a huge range of Xmas badges available on the website. Standard 25mm believe button badge made by hand in our Uk workshop.